I think about the story behind this home every time I walk past. It’s on the stretch of Euclid between 11th and 13th and is the only decrepit house on the block. Looks as though as one time it must have been an incredibly grand family home. The windows on the side (you unfortunately can’t see from the photos) are beautiful and amazing. Unfortunately, the roof looks to be rotting out, the porch is crumbling, bricks are visibly loose in several spots, it’s boarded up and the yard is completely overgrown. There’s also a rusted out old shell of a car on blocks in the rear. I am constantly wondering what the deal is with this place and whether or not it’s being held on to until it seems like the “right” time to turn it in to another condo building. I hope that eventually it can regain some of its past grandeur and I am hopeful that somebody is finally stepping up to take care of this property–from my last look at the back it *almost* looks like there are new windows and a new support has been added under a corner of the roof. The front gate is bolted with a rusted out padlock and I couldn’t see any visible permits but it would be great to have this home fit in with the rest of the block. Whoa, that looks like a 1963 Corvette Stingray split window coupe. Forget the house, that car rotting out is the greater tragedy here. I was about to say the same thing… wonder if they’d take an offer on it. I used to live directly across the street. Large animal population living in that building. Ditto the vette. Tragedy indeed. 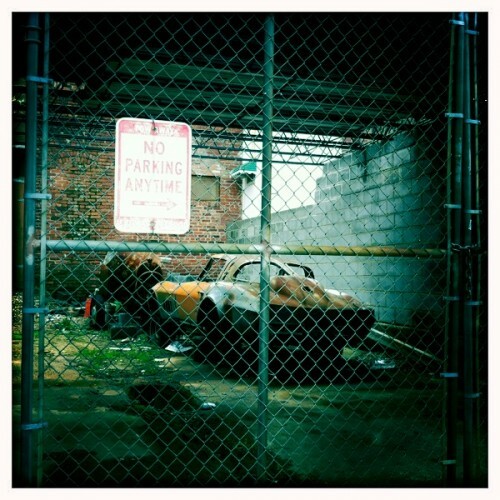 I live down the block and have lamented that car rusting out there ever since I moved in. The house itself has some cool architectural details, too. The stone work on the front just under the roof line is nice. Hmm, I guess everyone’s a critic. actually that shell looks in pretty good shape, looks like just surface rust. Where’s a flat bed when you need it. Corvette bodies are made of fiberglass. No rust. Looks like it would fit serial #s 30837S100001 – 30837S121513 and was possibly in one of the 7 original colors (maybe Daytona Blue, but difficult to tell from photos). I’m not sure what pisses me off more, the collapsing house or rusting vette. Vette. House can always be restored, Vette not so much. Plus, a lot more of DC Row Houses from that periods than ’63 split window Vette’s. 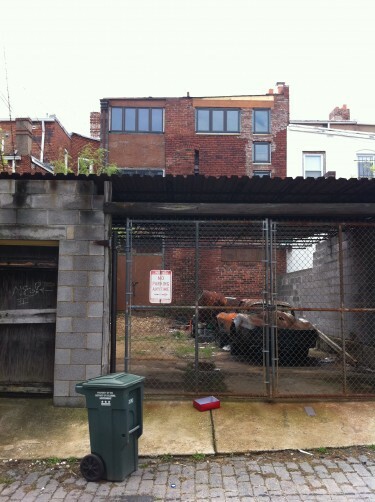 According to the DC property tax assessment database the property is listed as “blighted” and the owner lives in Shepherd Park near the Silver Spring border. I won’t post names, addresses etc, but the database is publicly accessible. he has a very nice house there. Why ontact the owner and ask him or her the simple question about the status of the property (and car) when we can have a thread full of uninformed speculation? I was just thinking about that yesterday too. So much potential. The place is giant. Realtor database says 3,648 sq ft! Was assessed at “only” 652,170 in 2010…if this place was fixed up it could EASILY fetch 2x that, though my inclination is that it would be cut up. scratch that all…DC assessment proposed approx. 575K for this year and a downward adjustment to 550K for next. madness. OP here: The house is at 1125 Euclid. As I mentioned initially it kinda looks like the back windows are new–looking again today it appears that the amazing side windows (used to be small french panes) are not so amazing but at least are new as well. Aside from those changes there really isn’t anything to suggest that a real update/rescue is being undertaken on the property. Interesting idea…though if the owner doesn’t care to save the property I’d be hard pressed to think they’d save the car. Sad situation with both things. House? Vette? Goats?! Can nothing be saved! How can a goat sacrificed afford $55k a year in blighted propert taxes? That makes no sense. 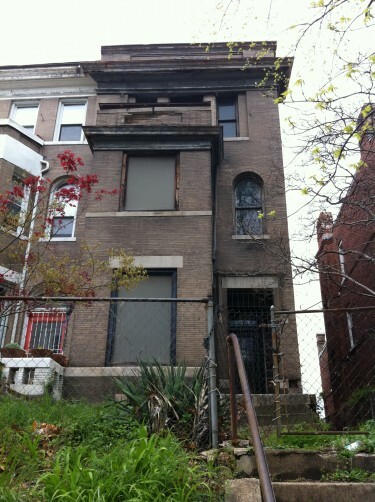 Ace in DC is right about the tax bill – a blighted property SHOULD be taxed at 10% (5% for a vacant but unblighted property, and .85% for a regular property). Now, hopefuly DCOTR is actually assessing them like that! Maybe it is better that he pays all this money so DC can avoid budget cuts!!!! @ $56k, he’s paying what’s equal to about 25 homeowner’s real estate taxes on houses worth about $300k! I say let’s bleed this fool for all he’s worth! I actually live next door to this house. We used to think it was a meth lab, now not sure. It’s owned by an old black guy about 60 years old. He comes by about once a month but never spoken with him. I’ve actually seen him in recent months on 2nd floor doing some brick work on the back of the house, but not sure exactly what he’s up to. It would have more foot traffic if it was a meth lab. But it does sound kind of shady? Would it be unreasonable to have the police / some DC housing organization come check out the house to make sure there isn’t a basement full of children or something going on? What’s the Story with Zucchabar in Adams Morgan?